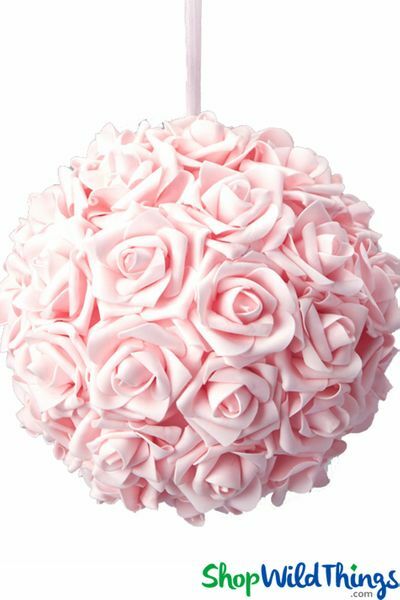 Home > Floral Decor > Flower Balls & Heads > Real Feel Flower Ball - Foam Rose - Pomander Kissing Ball - 11 1/2" Baby Pink - BUY MORE, SAVE MORE! We are so proud of our new line of Foam Rose Flower Balls not just because of the superior quality but also because of the exquisitely elegant look and feel! Our new Real Feel Foam Rose Flower Ball is the ultimate in floral Decor, ready for your special day! This Baby Pink Pomander Kissing Ball is 11 1/2" in diameter and the roses are approx. 2 1/2" in diameter. The soft shade on these pink roses is incredibly gorgeous and velvety! Flowers are a must at any event but they can be a lot to deal with so remove that stress and enjoy your moment!